I was checking my WordPress blog stats today and noticed I had 168,168 all-time views. Whoa! One of those spooky why-wouldja-look-at-that numbers that jumps out and knocks your hat off. posts yesterday, and it sank without a trace. I suspect (but can’t prove) that for some reason, many of my beloved followers weren’t notified. 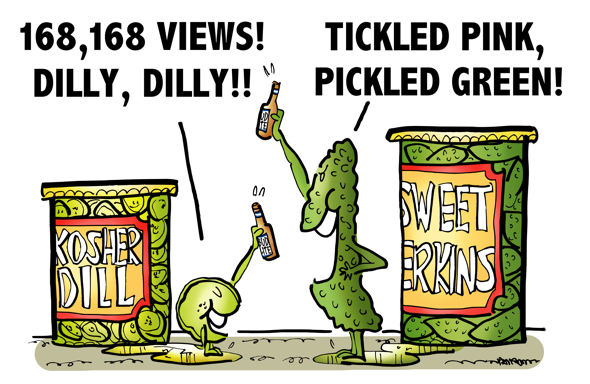 So if you missed yesterday’s exciting post about Bud Light’s “Dilly Dilly” television commercials and how they went viral on social media, do take a look. A WordPress stats glitch, perhaps? My views dropped to one or two a day a few months back, then all of a sudden they are routinely double or triple what they had been. Or what if Google changed an algorithm?! I’d’ve visited you but havn’t been here for a while, way behind, catching up now. 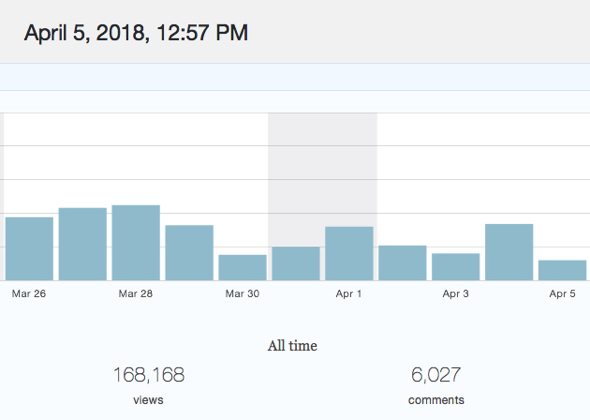 I’m pretty certain I don’t have 6,000+ comments which is often a true sign of dedicated/engaged readers.